The Epstein Hitting Certification Program is our highest level of training for both baseball and softball. 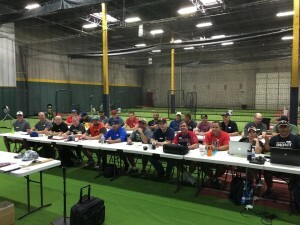 It is targeted to professional instructors, indoor training facilities, amateur coaches and most importantly parents of baseball and softball players. The majority of attendees are parents who are investing in themselves to work with their children. This is the greatest gift we can provide parents…the knowledge and system enable parents to stay connected in their kids’ athletic future. Although youth coaches and parents are typically the majority of attendees, we always have a handful of collegiate coaches in attendance as well. We cover everything from technique to the mental side. We will teach you everything we do on a daily basis…whether with 8 year-olds or big league players. We begin with all our drills, how to set up and complete correctly. Then we move on to problem solving using our motion analysis applications. Once we identify a player’s mechanical issues, we then find which drill will be best to attach the problem at hand. Every player is different and has to be treated as such. Once we arm you with our countless drills, we then need to determine which drill program is needed based on what the player video shows us. What makes Epstein Hitting so successful? The Certification Training covers every aspect of what makes Epstein Hitting so successful around the world. Information is great, but information without implementation means nothing. What sets us apart is the ability to teach and change players in a positive structured way. Anyone with an internet connection can see how the swing is supposed to look; but what makes our training so special is the ability to teach the proper swing in a systematic, ground up approach. Whether you are working with 5 year-olds or 25 year-olds, our training has you covered. Grants rights to the Epstein Hitting, Inc. name, affording instant credibility! Learn to effectively analyze videos and the most important factor of all: how to correct what is incorrect!